Students Discover Celebrates National Fossil Day! To celebrate, we here at Student’s Discover, and especially me the resident paleontologist, want to give a quick update on the incredible results that middle school kids have already made on the Shark Teeth Forensics project through the Paleontology and Geology lab at the Nature Research Center, NC Museum of Natural Sciences. First, I need to give a huge “Wow, I’m impressed” to the three Kenan Fellows teachers working on this project (Kimberly, Kerrie, Juliana) because they’ve transformed their middle school classrooms into real deal research teams. And second, I need to shout out another huge, “Wow, I’m impressed” to the students, because they have managed to exceed all of my expectations about what scientific data can be acquired by young adults. (2015 students, be warned — the bar is really high now!). So far, the lessons that each of the teachers created over the summer and implemented in their classrooms this fall have worked pretty well. In total, students have discovered several hundred shark teeth in just under two hours of classroom time spent searching buckets of sediments collected from the Aurora, NC mine. 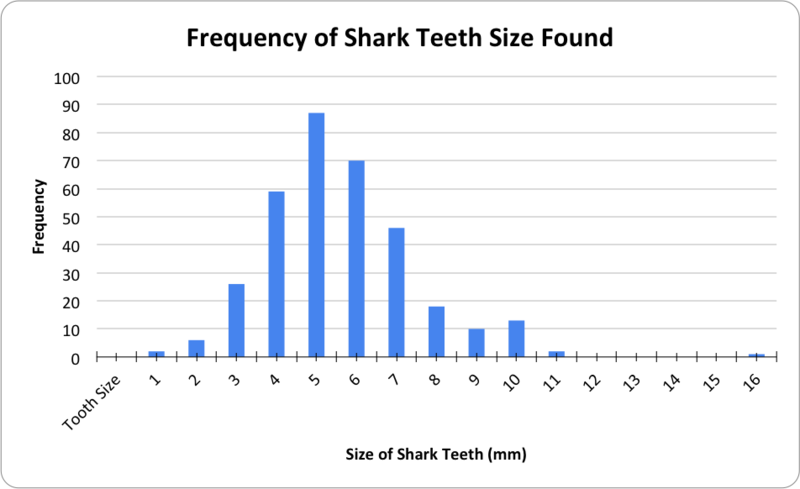 Additionally, they have measured many different dimensions of the teeth and plotted size vs. frequency histograms. New discovery alert: each histogram recorded by students is a fantastically normal distribution around 5-6 mm in tooth size…Not what I was expecting!! Hot-off-the-presses data from Juliana’s students at Exploris Middle School. Lessons to be learned so far from Shark Teeth Forensics: 1) There is never enough time to look for teeth. The students loved finding the teeth and other things in the quarry sediments. 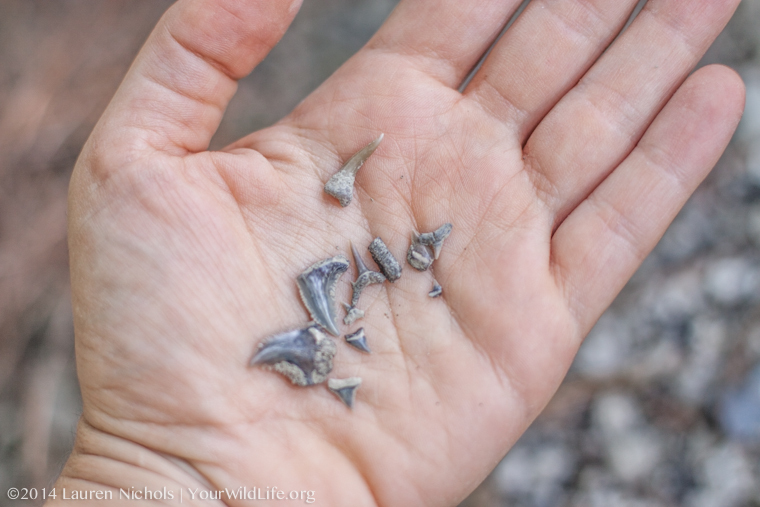 After a while finding shark teeth became almost passé, and those that found other fossils including fish teeth and at least one dolphin tooth thought it was so cool to be finding new types of animals in the same dirt. 2) There needs to be time for the students to share their discoveries. We all wanted the students to come away from the Shark Teeth Forensics project feeling like they owned a piece of the research pie. So hopefully with groups of students showing some of the teeth they found and discussing differences in tooth anatomy amongst their peers, not only will they own a piece of the pie, but they will slather it in vanilla ice cream and eat it all the way home…where the students can become the teacher-scientists in their families and neighborhoods. Dr. Terry “Bucky” Gates is a paleontologist at the NC Museum of Natural Sciences and leader of the Shark Teeth Forensics team for Students Discover. He uses field and evolutionary comparative methods to better understand the evolution and preservation of ancient ecosystems. You probably heard about his most recent discovery in the news: a duck-billed dinosaur with a giant nose! Follow him on Twitter @terryagates.